On this page you will find what I consider "Sarah´s Must-Haves" engineering tools. I created them because of eithr issues that I and could not find a tool that could help simplify/accomplish the task or a tool/extension to accomplish the task. 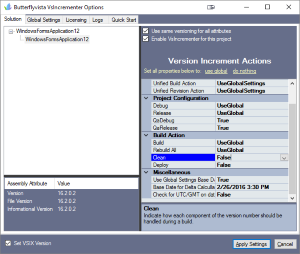 This full-featured extension to Microsoft Visual Studio adds missing customizable auto version increment capability, so that you can increment either the AssemblyVersion or the AssemblyFileVersion attributes (major, minor, build, and/or revision) in the AssemblyInfo file for your projectst. Yes, this tool supports the latest and greatest Visual Studio released by Microsoft. Anyone who has ever had their SMTP mail server hacked, email password compromised, monitors their SMTP and POP3 records, or simply wants their server secured will appreciate this tool. This Windows based tool allows you to pull your SMTP log based on the date that you select, parse the information, and automagically create a list of IP addresses to add to blacklist on your server. The GUI gives you the EHLO field, if available, as well as email addresses used. You can review the IP addresses to add to blacklist list and then commit the entire list with the click of a button, pretty way cool. For added flexibility, you can pull the current blacklist and delete one or more IP addresses. With this tool, you can reduce spam and reduce the likelihood of your server being compromised directly. Moreover, if your webhosting company asks you how you are protecting your server, you can answer them that you monitor things closely.